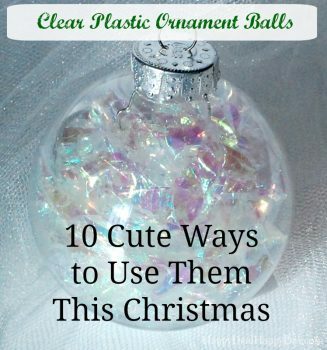 Clear Plastic Ornament Balls - 10 Cute Ways to Use Them This Christmas | Happy Deal - Happy Day! 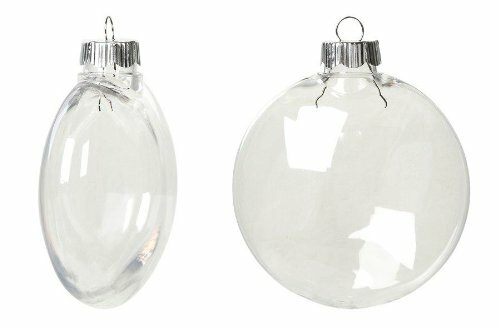 Creative Hobbies® Clear Plastic Ornament Discs 80 mm (3.15") Diameter - Pack of 12 - Great for Crafts! 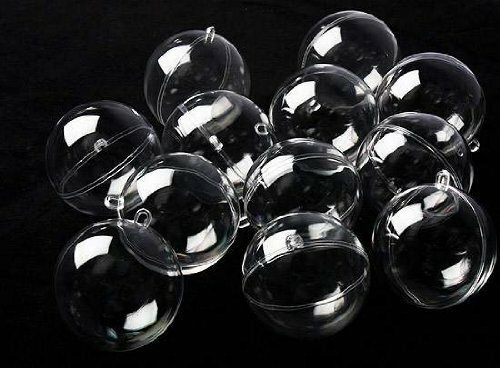 Darice 12 Pieces, 80 Millimeter, Clear Plastic fillable Ornament Ball. 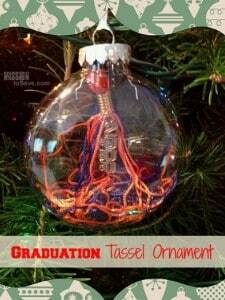 I have a few ideas that are on my own personal tree, and I found some other great ideas from fellow crafty bloggers. 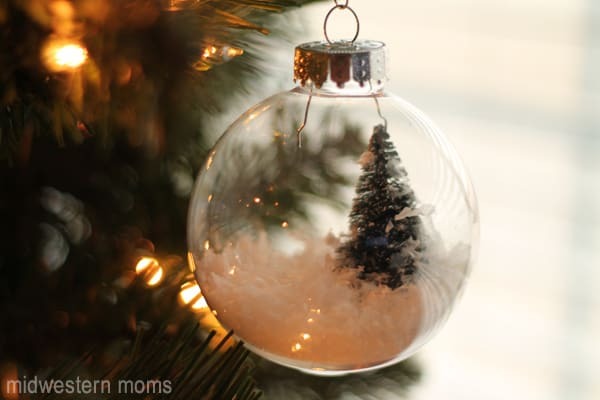 Hope you feel inspired – send me pictures of any ornaments you try that end up on your tree! 1. 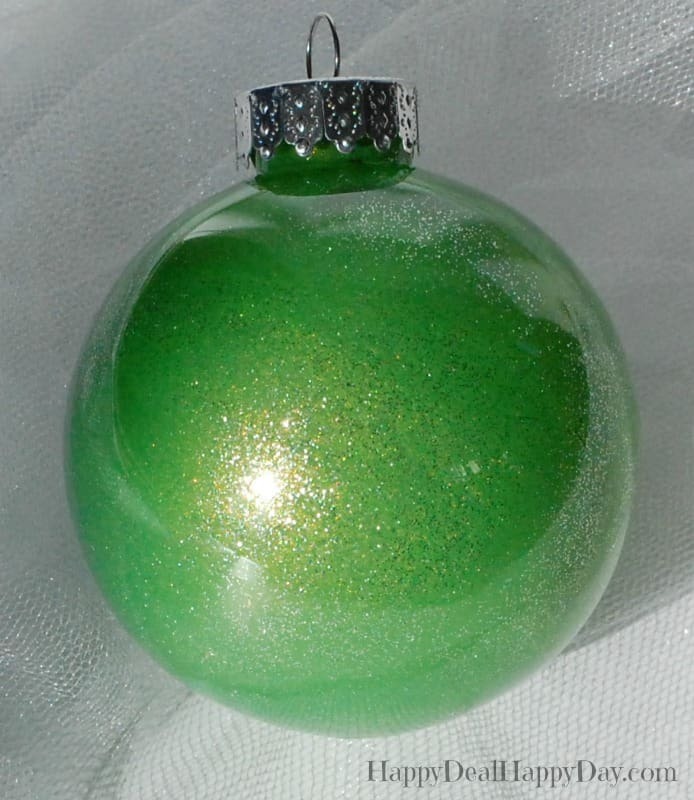 Glitter Nailpolish: I found some green glitter nailpolish and poured some into the empty bulb. I swirled it around until the ball was completely covered. This one would be fun to try other colors, or more than one color and do a fun swirly pattern! 2. Keepsake Christmas Dress: I have 2 daughters, which means each Christmas I have a blast finding them each some fun and festive dresses. They usually only wear them for their Christmas card pic, and on Christmas day. Its kind of a bummer they don’t get more use. 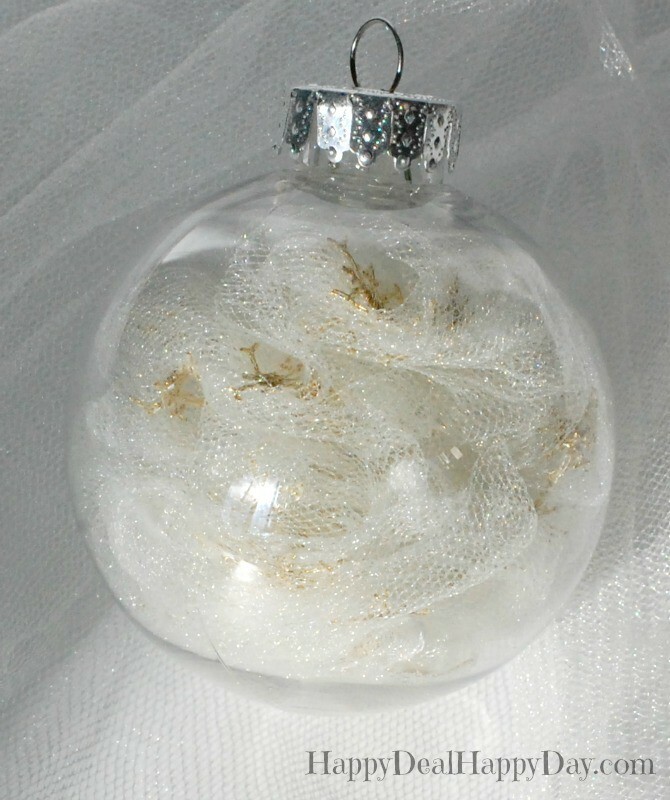 But in order to preserve the fun Christmas memory, I took some snowflake tulle from my oldest’s 2nd Christmas dress. It’s a fun way to keep a memory, and give the dress one more use. 3. 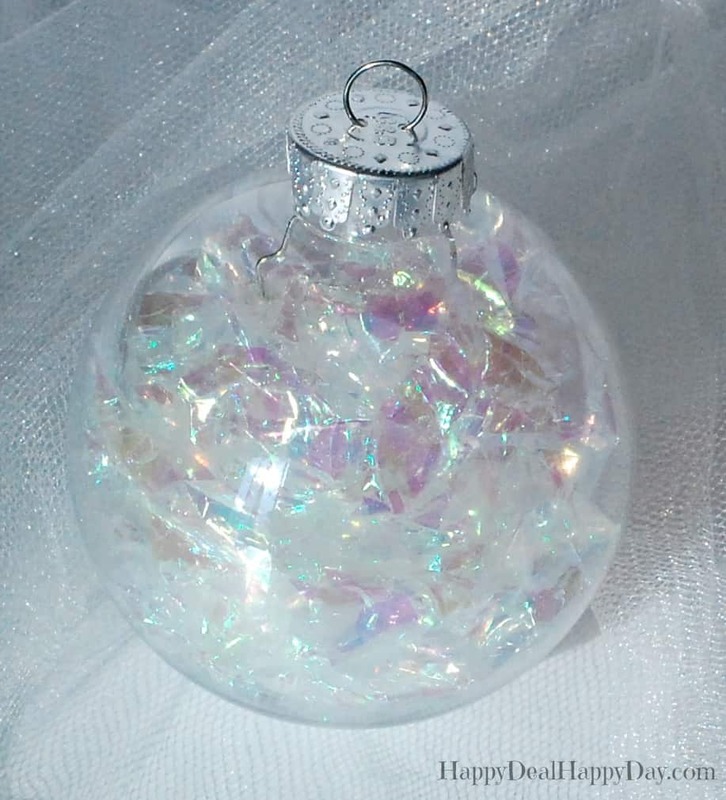 Cellophane: This iridescent plastic cellophane is fun to crinkle up and place inside the ball. 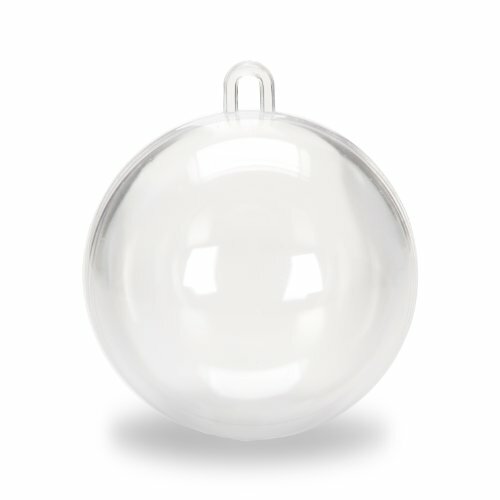 It gives off fun colors and would sparkle beautifully next to Christmas tree lights. You can get some cellphone over on Amazon here. 4. 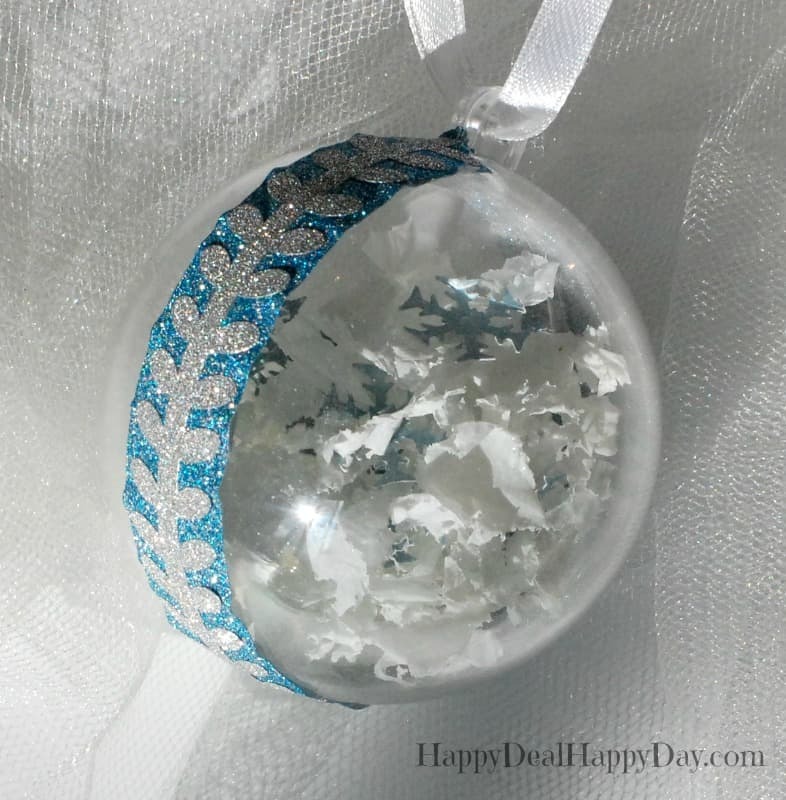 Fill with Fake Snow and Paper Snow Flakes: Grab some fake snow and this snowflake paper punch and fill the empty plastic ball with those! I also embellished this one with some fun glitter washi tape too! 5. 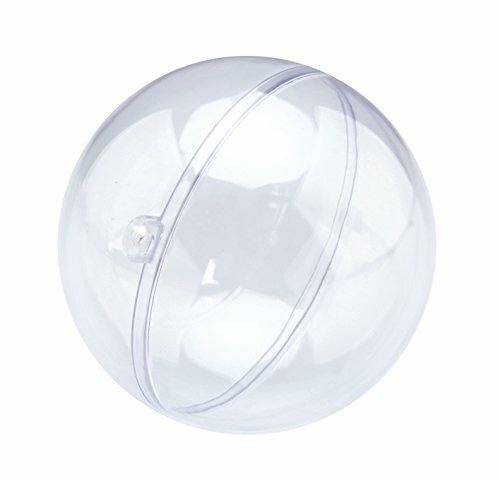 Snow Man: Make your clear empty ball into a snow man! Fill it with white crinkle cut paper shreds and use some sharpies to draw on a snowman face on the front. 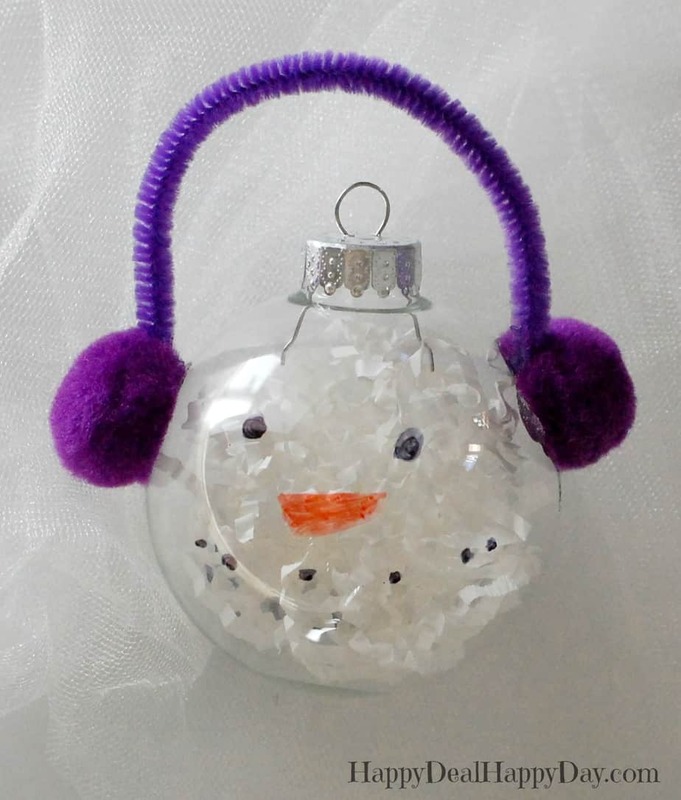 Grab a pipe-cleaner and puff balls and glue on some snowman ear muffs as well! 6. Check out how to make this cute Graduation Tassel Ornament from Mission To Save! 7. 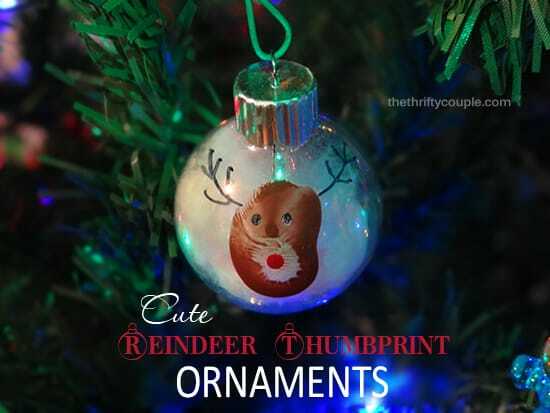 Here is a cute Thumbprint Reindeer Ornament from The Thrifty Couple! 8. 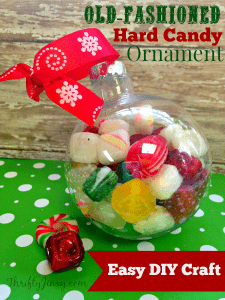 I love the colors in this Old Fashioned Hard Candy Holiday Ornament from Thrifty Jinxy! 9. This is an adorable keepsake ornament for Baby’s First Christmas from Midwestern Moms! 10. 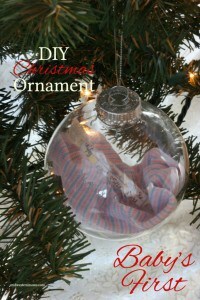 I’m in love with the tiny Christmas tree in this Homemade Christmas Tree Ornament from Midwestern Moms! 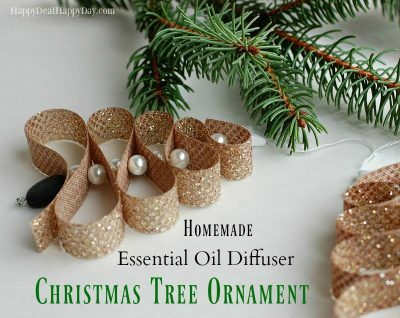 Be sure to check out this Essential Oil Diffuser Christmas Tree Ornament project as well! 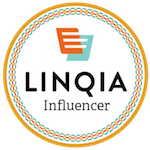 Pin this list for future inspiration!!! ← HOT DEAL! $0.23 Ocean Spray Pink Cranberry Juice at Wegmans!!! I have done these types of ornaments with clear glass ornaments, but they are so fragile I quit making them. Using plastic makes a lot more sense. We like to put photos printed on overhead transparencies backed with white paper, then put tinsel behind them. They are really attractive. I didn’t even know they made these in plastic. Good to know! These are all great ideas. I especially like the one with the small christmas tree inside. 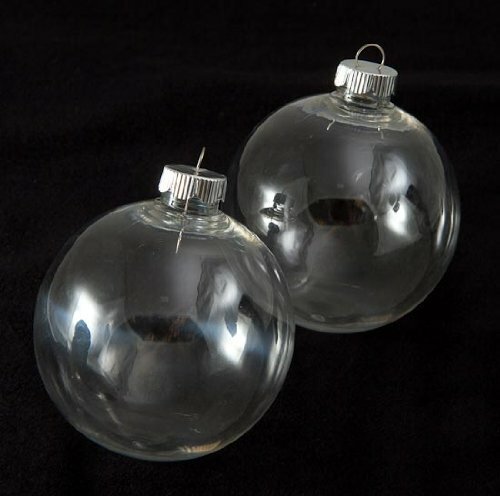 The use of these plastic clear ornaments is great because they are sturdy and so versitile. Happy Holidays. enjoy! Hope you have fun with some new found creative ideas! Oh good to know Kathy – Thank you!!!! I fill with onion dip mix, with instructions of what to add and how much. Decorate with Christmas ribbons. I actually didn’t measure. I just poured in maybe a third of the bottle of nailpolish and swirled it around. If you can’t get the entire thing covered, then pour in more. And if there ends up being too much you can pour it back out or just let it dry on the bottom. I folded paper bills into small squares and put inside. A red bow on top made them look festive. I’m gifting these to teens this Christmas.